Home > Products > Bags > Formalin Storage Bags > Formalin Storage Bags - 7 x 8"
The liquid-tight formalin bag with vapor barrier effectively prevents the transmission of harmful fumes associated with formalin. This unique bag is made by a patented manufacturing process which eliminates leaks. Made from strong 3-mil Serinex, the Bitran Formalin Bag provides long-term protection. 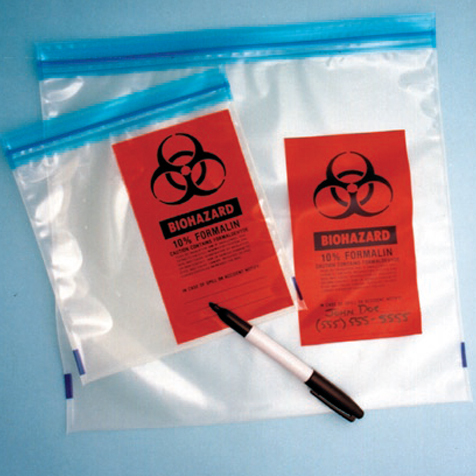 For added convenience, the bag is preprinted with a biohazard symbol, formalin warnings, and emergency response block as required by OSHA. The doubletrack zipper provides easy closure and airtight security. Packaged in packs of 250 each, four packs per case.